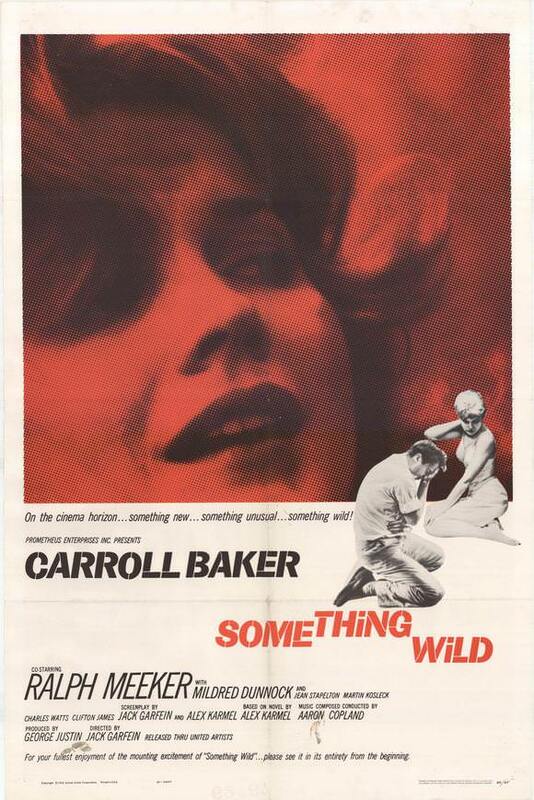 SOMETHING WILD (1961) Directed and co written by Jack Garfein is said to be ‘a lost indie film classic”. This picture lives up to that suggestion and more even if it is rarely seen today. 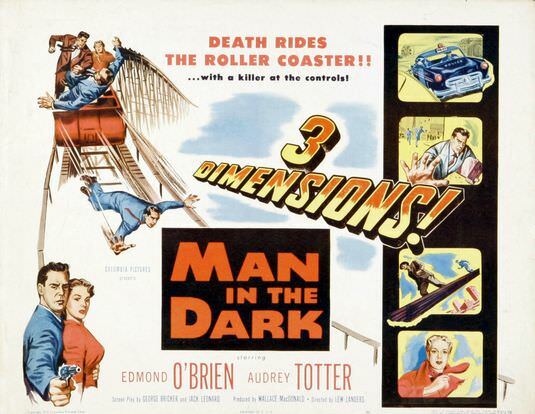 A jarring piece of film making complete with strong performances by Carol Baker, Ralph Meeker and others. 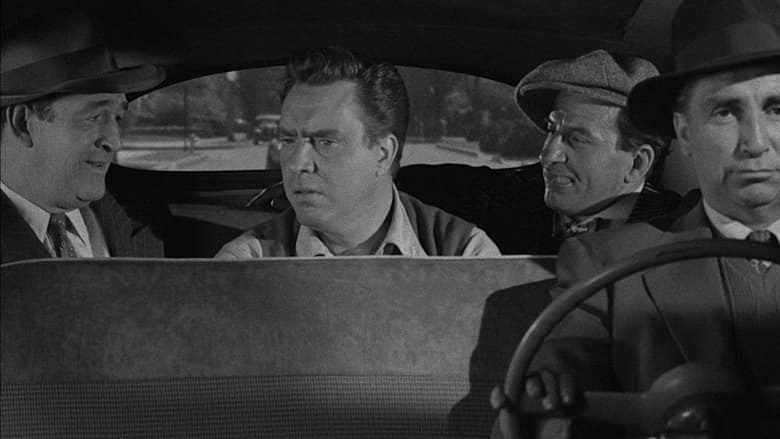 Youth films flourished in the late fifties and sixties with the style of HIGH SCHOOL CAESAR (1960) and many others usually involving a leather glad delinquent that gets redeemed by ‘rock and roll ‘music or a winning a race in a hot rod. 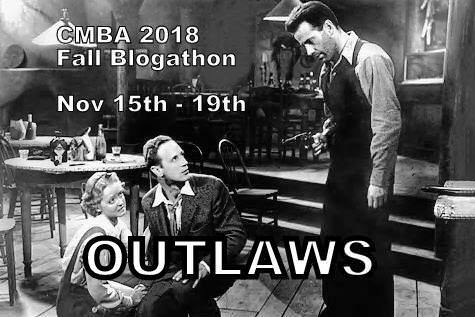 Such pictures were good fun to watch yet with some notable exceptions like Brando’s THE WILD ONE (1953) , REBEL WITHOUT A CAUSE (1955) and the lesser known WILD SEED (1965) with Michael Parks took the theme of “Teenage trouble” and the accompanying society alienation seriously much less making the female the main story. SOMETHING WILD (1961) takes it all a step forward with its almost “French New wave “cinematic title sequence by Saul Bass featuring, vehicles, painted road lines, time distortion all to a scored by a young Aaron Copeland. 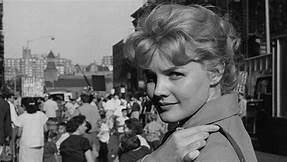 The story of a young New York girl who is brutally raped in a park and her method of finding here own way after is heavy issue today even more so in 1961. Carol Baker in only her third role after BABY DOLL (1956) and a role in GIANT (1956) gives a defining performance as Mary Ann Robinson. The cast is filled out by early roles from two soon to be television legends in the person of Jean Stapleton who would go onto to immortality as “Edith Bunker” in ALL IN THE FAMILY. 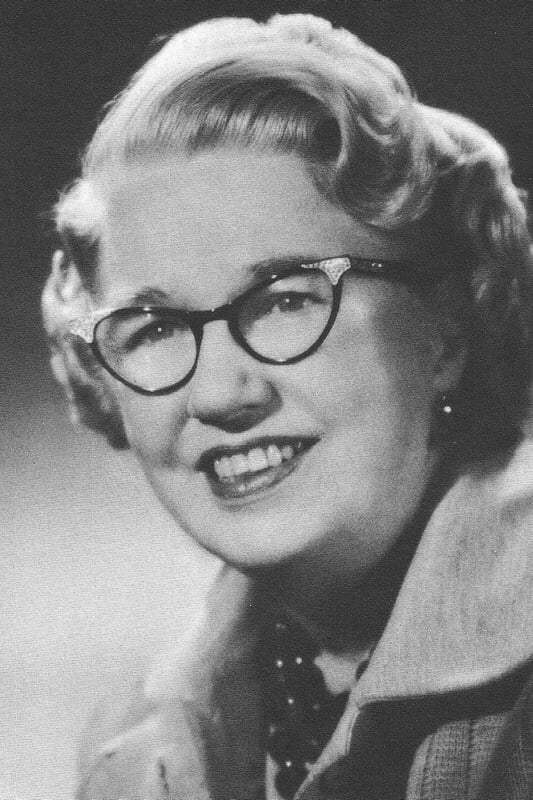 Stapleton takes her turn in two brief scenes as a sleazy boarder Shirley Johnson who lives next door to Mary. Doris Roberts as “Mary’s store coworker” who would become “Maria Barone” in EVERYBODY LOVES RAYMOND. The actor that steals the show in a small role is Martin Kosleck as slimy landlord of the house that Mary ends up living. Kosleck made a career of playing evil mostly Nazi like Conrad Veidt before him yet in this picture Kosleck is like a leering tattooed snake. Veidt and Kosleck both were born in Germany and fled the tide of Hitler to portray an aspect of their country that they both hated. A young Diana Ladd is listed as having a bit role. 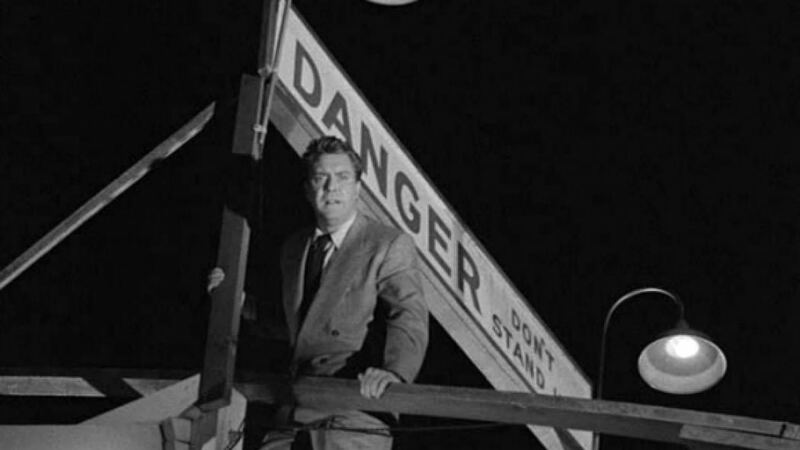 SOMETHING WILD (1961) derives its power from its black and white stark images. 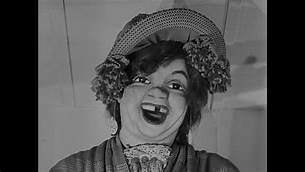 Many of these styled in Noir lighting and German expressionism of the decent into Mary’s existence. We see crowds, and large spaces in the beginning of the film only later to be replaced by shadows, darkness and even the people become the enemy as Mary is trapped on subway. The people fight and battle to get on an off the cars often looking to be within a moment of real violence to those around them. The real New York locations sure as the Bowery become even more foreboding as you see nothing but “lost people”. The attack on Mary is particularly well handled for sixties as while its brutal in it intent The moment becomes singularly not comfortable sense wise when you see the simple shot of Mary’s garter and her bare skin pressing into a rock during the attack. That is all one needs to see to understand what this attack is unlike many of the film makers of today showing more images. One knows the room is vacant when you place one object in it. 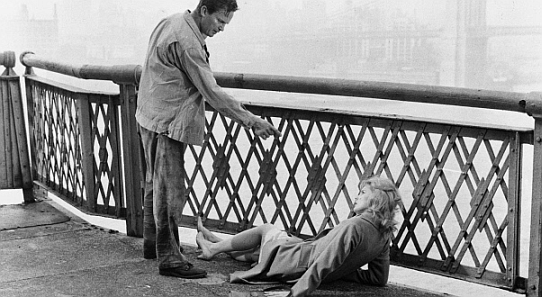 SOMETHING WILD (1961) become Film Noir in its outlook on life in the pictures second half. The torture that both Mary and Mike feel and do to each other is the story. Classic Noir theme of being both are trapped in something be it the past or what they have been branded by society. Mary and Mike are locked physically together suffering like addicts by their situation only to find a type of redemption. Mildred Dunnock plays Mary’s mother Mrs Gates masterfully as she tries to make amends being oblivious to her concerns similar to Jim Backus as James Dean’s father in REBEL WITHOUT A CAUSE (1955). Mrs Gates pleads with her daughter to come home and to restore the world as before but Mary know that it can never be the same. 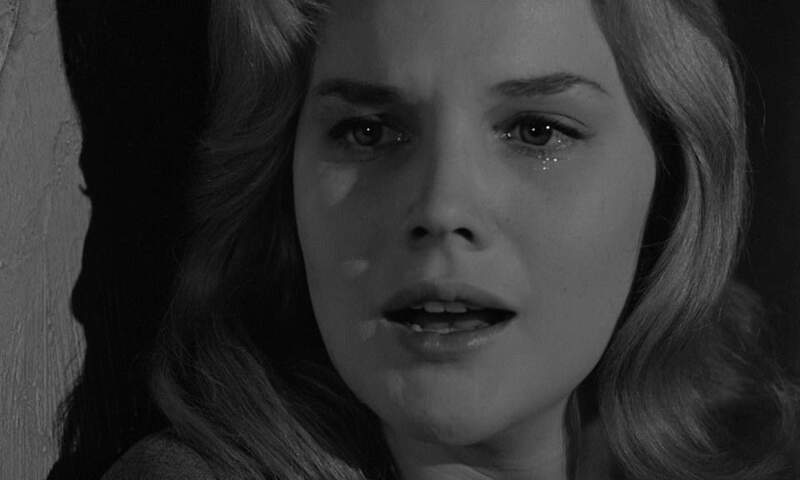 SOMETHING WILD (1961) lives up to its billing as a lost classic. 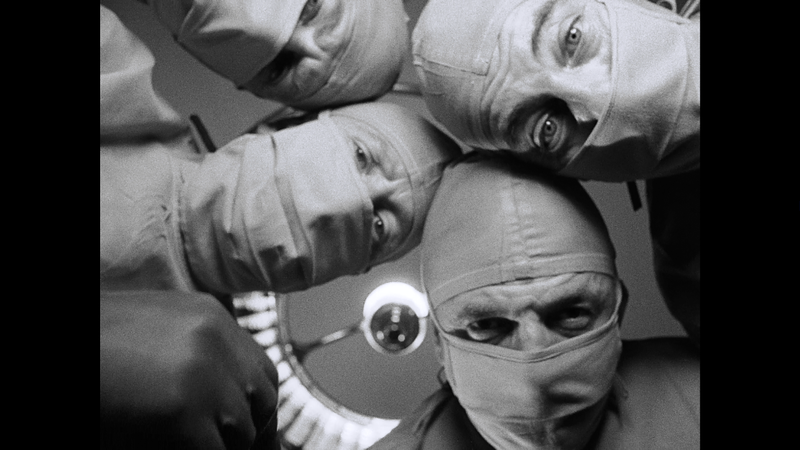 It features expert direction, acting and camera work worth of a small classic picture. 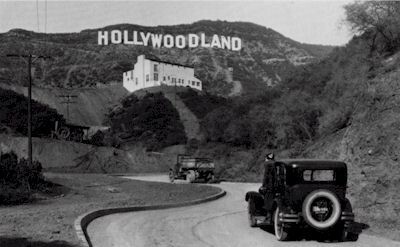 In somewhat Hollywood tradition it was not well received by the public as it was often to intense and bleak. The picture was the last to be made by Director Jack Garfein which is a shame. See this hard to get film if you can. It is not often I post about war pictures as Classic Film, so I thought I would put my boots in on the Otto Preminger directed picture IN HARM’S WAY (1965) with John Wayne and a host of others. Wayne crossed many genres, yet he will be forever remembered as the gun totin,’ fist swingin,’ righteous cowboy. He can be accused of playing himself in his films – not a bad thing as audiences loved him in those roles. This makes his work in the role of Admiral Rockwell Torrie all the more interesting. 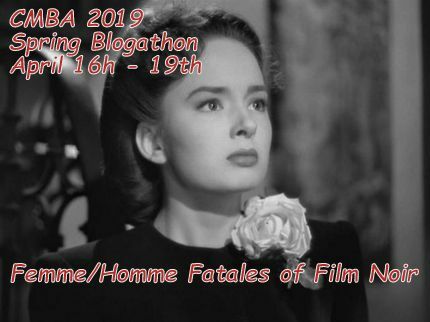 IN HARM’S WAY puts Wayne squarely where he has been before, fighting in the Pacific as he had done in FLYING TIGERS (1942) , THEY WERE EXPENDABLE (1945), OPERATION PACIFIC (1951), THE FIGHTING SEEBEES (1944), SANDS OF IWO JIMA (1949), and BACK TO BATAAN (1945). 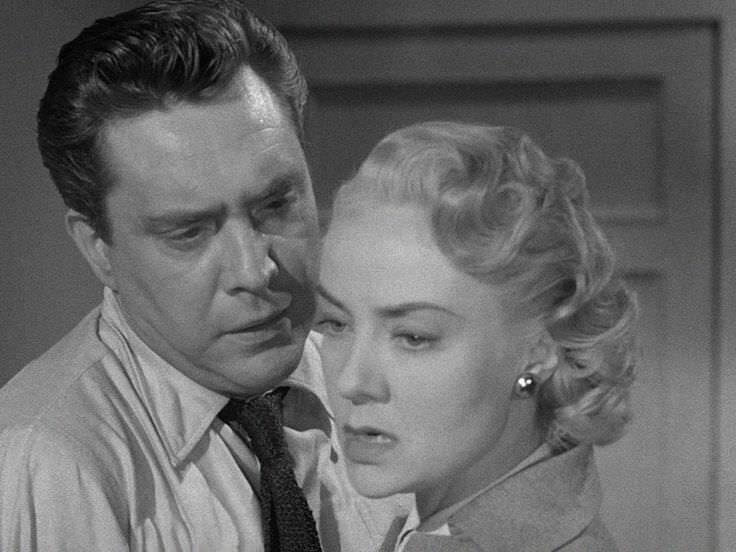 Familiar territory for him yes, but the material is seldom told with such a gritty edge then in this picture, thanks mainly to producer/director Otto Preminger. The picture features an effective use of black and white photography in the age of exploding colors. Color television was out, but a lot of us still had black and white images of combat footage from the Vietnam War that had been broadcast into homes on a daily basis. Stanley Kubrick’s black and white nuclear insanity picture DR STRANGE LOVE or HOW I LEARNED TO STOP WORRYING AND LOVE THE BOMB was produced in 1964. The world was just a few years away from the Cuban Missile crisis. 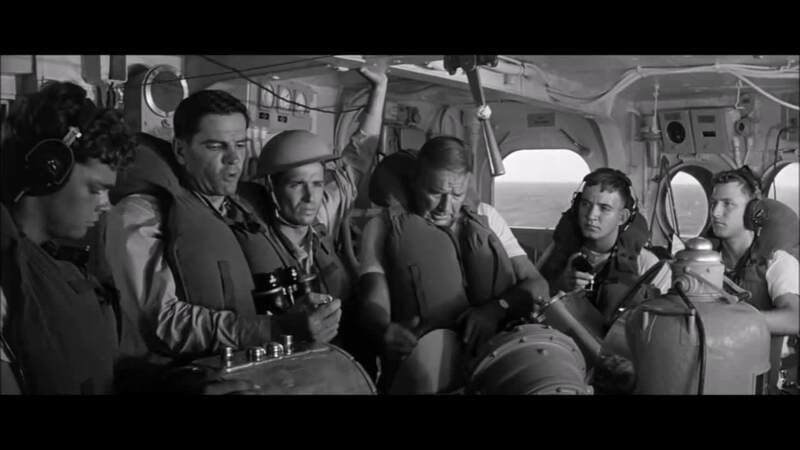 There was also the1962 Steve McQueen anti-war film, THE WAR LOVER, which featured black and white photography and an edgy screenplay by Howard Koch. IN HARM’S WAY was not about that time, of course, yet it did has the sense of a ‘grown up’ war film in spite of the fabricated story. Grown up in the characters we see; some of these people have a dark side to them. The picture does teach what I would call ‘the sadness of war.’ The death of people in non- battle sequences is particularly jarring, showing how it is sometimes harder for us to justify the death of one then the death of many. 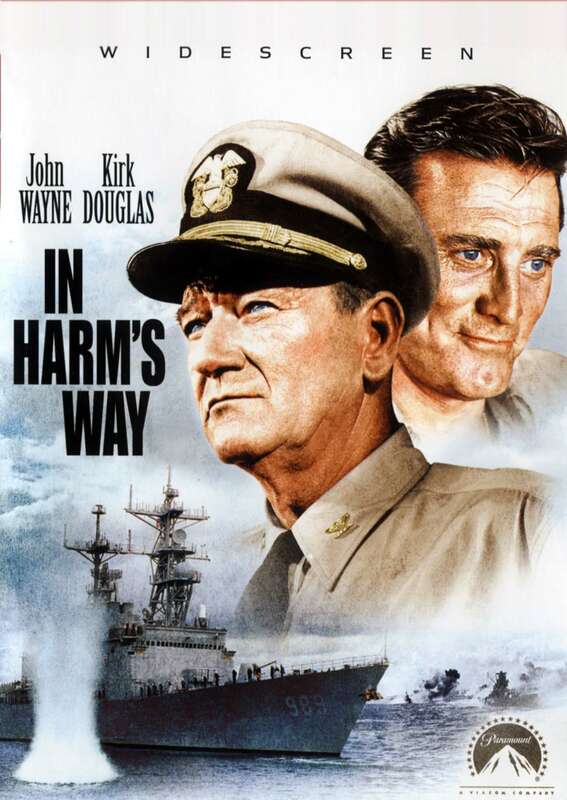 IN HARM’S WAY deals with the event of Pearl harbour and the battles of Guadalcanal. The location names are changed; not the most important lapse in the picture as it is a story about the people. It could be said it becomes a soap opera as it shows scenes of clubs and domestic life as relationships are formed. Today these moments are used to create sympathy for the characters as they will end up being killed later on. One difference is that IN HARM’S WAY does not feature the ‘training camp’ or ‘refit’ sections in which we are introduced to people in the film. You get right to the ‘boots on the ground’ feel of real Navy people and actual situations. The picture was shot aboard battleships, with real sailors doing what they do such as sounding general quarters with a bugle through an intercom. Wayne was without some of his standard crew of film people such as Ward Bond and stunt man Yakima Canutt. 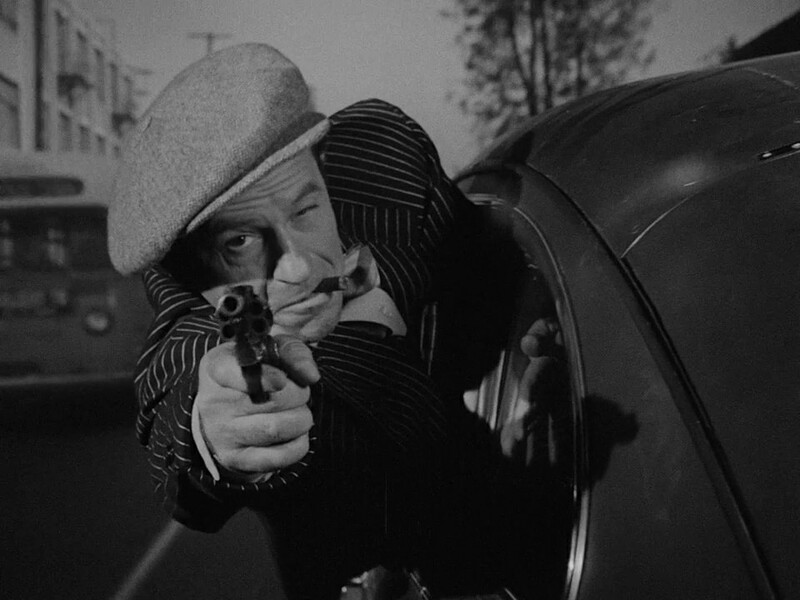 The film features some tasty performances by people such as Franchot Tone as a commander resigned to his fate. 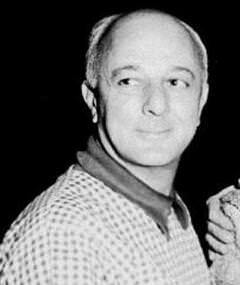 Tone was a handsome, golden voiced fellow who was once the husband of Joan Crawford. He was theatre trained and made a career of playing rich men, royals, inventors, spies, and society people opposite the likes of Cary Grant, Jean Harlow, Clark Gable, and Loretta Young. 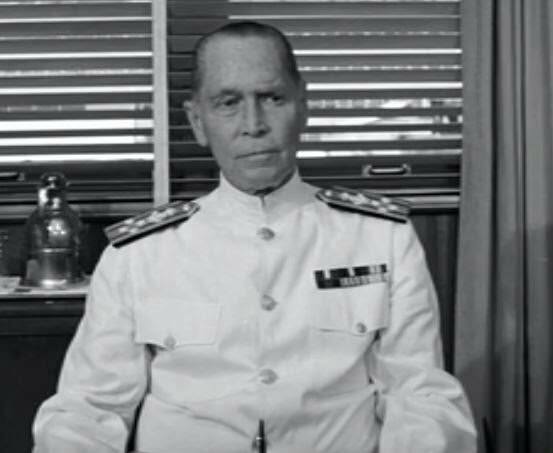 He is brilliant in his scenes as the Admiral who will get blamed for the “Pearl Harbour Disaster’ as it happened on his watch. Tone confidently strides through the opening attack, bullets flying, bombs exploding in his Navy white dress uniform, grim faced to his briefing on the situation. 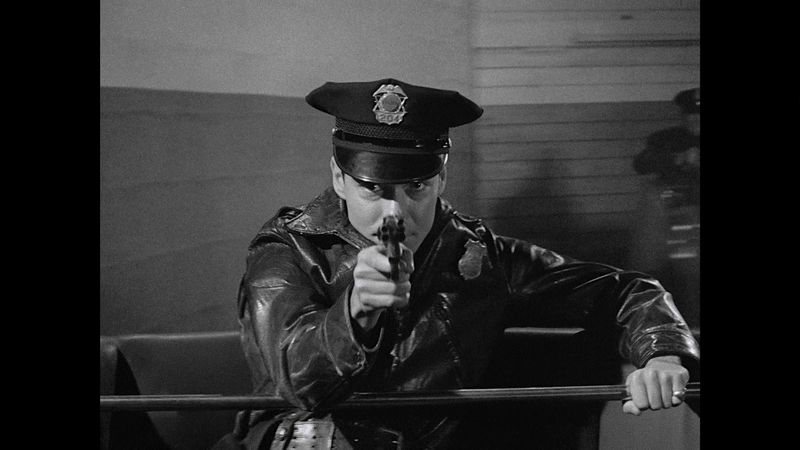 Tom Tryon as Lieutenant Junior Grade, William McConnel and his wife Bev played by surprisingly vulnerable Paula Prentiss, whom we meet at a large party on the eve of the attack are also standouts. Tryon gives McConnel a resolute approach to duty as his character moves to having full command of a destroyer thrust upon him in the heat of battle. The men grow to love his character as is shown in a wonderful scene at a dock with his men after an ordeal lead by film personality Slim Pickens. 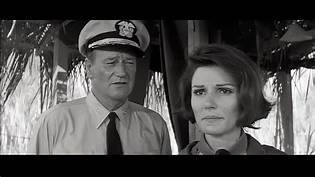 Paula Prentiss’s best moment is when John Wayne’s Rockwell Torry comes to tell her that her husband is reported missing in action. She is an aircraft observer required to report all flight activity from her check point on the radio. She bravely continues to do despite the tears: only to falter at the last moment and require help. 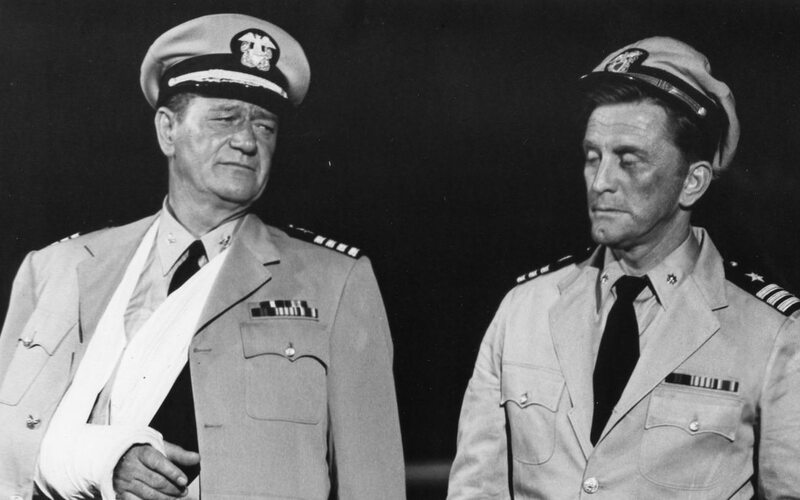 Kirk Douglas as maverick Commander Paul Eddington is continually given chances by Rockwell Torrey, whom he calls The ‘Rock of Ages.’ He runs a gambit of character texturing from cynical officer to drunk to widower to assaulter of women. When he learns the girl he assaulted is a suicide victim, Eddington leads an unauthorised low level solo recon flight mission that uncovers the massing of enemy battleships in which he meets his end. In an interesting turn from the Hollywood cliché when asked whether Eddington should get the medal of honour for his bravery, Rockwell Torrey, his trusted friend who knew that he assaulted the Nurse responds, “No recommendation,” thus abruptly ending the scene. Look especially to the chemistry between John Wayne and Patricia Neal as Nurse Lieutenant Maggie Hayes whom he meets while convalescing. Brandon De wild (who is blessed with the most irritating voice for in film – he played the youngster who yells ‘SHANE’ in the film of the same name) plays the grown up estranged son Jeremiah to John Wayne’s character. When we first see them onscreen, it was a moment that mirrored Wayne’s real life relationship with his own son as he confronts the fact that his boy has been raised by his mother whom he has no part of in watching growing up. He didn’t even know he was in the Navy. Patrick O’ Neal as the smarmy Commander Neal Owynn was more interested in keeping the war clean and on the level for the public gets his comeuppance in a washroom. Wayne is not the action hero as he was in so many of his films here but rather a father figure of sorts, letting the action unfold around him. Confidences abound as Wayne shares scenes with Henry Fonda and others. He gives a subtle performance, especially in moments when he lowers his voice and when he receives casualty reports involving his son. This was also the film that Wayne was doing when he was diagnosed with lung cancer and began his real life battle. It shows in his physicality mostly his face and his movements. There are many such performances in this picture that I am going to leave out for the viewer to discover which deserves repeated viewings of all 165 minutes. 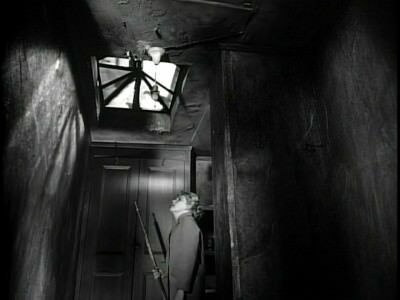 IN HARM’S WAY (1965) was ignored by most credits and awards, this does not necessarily mean it was a bad film. 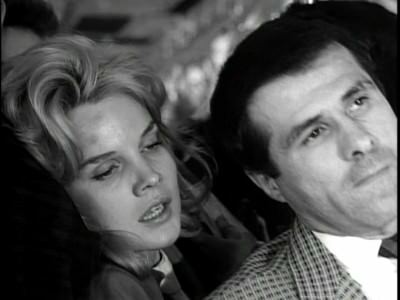 It has a jarring style of black and white photography along with abrupt scene endings as simple as fade to blacks followed by fade up to new scenes, different than the color washed, zoom in world of 60s cinema. It is filled with vulnerable characters in a world about to turn upside down. I also found the closing credits in the use of images that bring us to speed culminating in the mushroom cloud. IN HARM’S WAY, similar to the fate that happened to another John Wayne film the Western ‘ THE BIG TRAIL’ (1930) director by Raoul Walsh. This picture was produced in black and white using some silent footage as sound was still in its infancy. Much of the silent footage was re-shot or dubbed later similar to IN HARM’S WAY having a throwback look to it as it was done in the 60s. THE BIG TRAIL featured several small performances that added texture to the story plus it was produced in wide screen format for select theatres. It is an early John Wayne Western that is often over shadowed by the worthwhile STAGE COACH (1939). Now it is getting a new look. Here is hoping IN HARM’S WAYS get to be seen by more people with the same treatment.